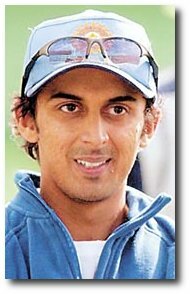 Rohan Gavaskar (born February 20, 1976 in Uttar Pradesh) is a cricket player and the son of former Indian batsman Sunil Gavaskar. He is a specialist middle-order left-handed batsman and a part-time left-arm-orthodox spin bowler. Having spent many years in the shadow of his more illustrious father, he was selected for the Indian cricket team to tour Australia in 2004 and played in a few ODIs, after Mohammad Kaif was forced out of the team due to injury. However, his last international game to date came in the 2004 ICC Champions Trophy. In Indian domestic cricket, he represents Bengal in the Ranji Trophy and East Zone in the Duleep Trophy. He was given the names Rohan Jaivishwa by his father as a tribute to his 3 favourite cricketers - Rohan Kanhai, ML Jaisimha and Gundappa Vishwanath. However, on cricket scorecards, his full name is usually credited as Rohan Sunil Gavaskar.